Which Jose Mourinho will we see at Sunday’s Manchester derby? The mischief-making, soundbite-spouting Special One with a neat line in wind-up celebrations and a regular standing order to football’s authorities? Or the one we saw for much of a stodgy opening to Manchester United’s season – a surly Mourinho apparently picking fights with his own players and club. That Mourinho oversaw United’s worst start to a season in 29 years. He even denied their Carabao Cup exit to Derby was a defeat – as they were beaten only on penalties. At one point United legend Paul Scholes said he was “sick of him moaning”. But, with the Red Devils having won their past two Premier League games – and secured a stunning Champions League win over Juventus in midweek, has something changed? Are these the five clues that ‘JoMo’ (stick with us) has got his mojo (it’s an anagram, see) back? Mourinho’s facial expressions and gestures have often been the stuff of dreams for gif-lovers, meme makers, and those who just like poking a bit of fun. He was at it again on Wednesday – cupping an ear to the Juventus fans and infuriating defender Leonardo Bonucci in the process. It’s not the first time this season the Portuguese has made his feelings known to rival supporters. Cast your mind back to October’s 2-2 draw with Chelsea – a game memorable in Mourinho-land for more than one reason (but more on that later). Mourinho wasn’t best pleased at being taunted by home fans throughout the game. His response? Raising three fingers – one for every Premier League title he won with the Blues – in their direction after the final whistle. In the first couple months of the season, a standard shot of Mourinho showed him slumped in his dugout seat, looking uninterested. But, from losing four games in all competitions across August and September, United have been beaten just once in October and November. Now Mourinho is pacing the touchline, shouting instructions to his players, and even getting involved in scrapes with opposition coaches. Cue incident number two from that match at Stamford Bridge. After Ross Barkley scored an equaliser for Chelsea in injury time, a furious Mourinho jumped from his seat as Blues technical assistant Marco Ianni celebrated in front of him before pumping his fists in Mourinho’s direction. The United boss was held back by a mixture of stewards and staff as he attempted to get to Ianni. Players often let their emotions get the better of them, particularly if they’ve got fans on their back – witness Wayne Rooney’s comments into a TV camera as he left the pitch after England’s 0-0 draw with Algeria at the 2010 World Cup. And, of course, Mourinho himself is no stranger to a post-match outburst. Last season, he made a shushing gesture towards the nearest lens after the victory over Tottenham. Last month, the Football Association charged him with swearing in Portuguese at a camera after his side’s win over Newcastle (but, again, more on that later). And, in September, he and midfielder Paul Pogba were involved in what looked to be a heated exchange while the cameras were rolling at United’s Carrington training ground. The FA is appealing against the decision not to charge Mourinho with the offence of using “abusive, insulting or improper language” following the Newcastle game, as the Red Devils successfully contested the original charge. A lip reader was brought in to interpret the 55-year-old’s remarks, but BBC Sport understands United produced a strong defence and feel vindicated by the outcome. But if the FA appealing against a decision is rare, how about getting two charges in the same week? Well Mourinho managed that in his early days at United. First, he was in trouble over comments about referee Anthony Taylor before the game with Liverpool, and he was sent to the Old Trafford stands by Mark Clattenburg five days later. On that occasion, during a 0-0 draw with Burnley, he was accused of using abusive or insulting words to the officials in or around the tunnel area at half-time. 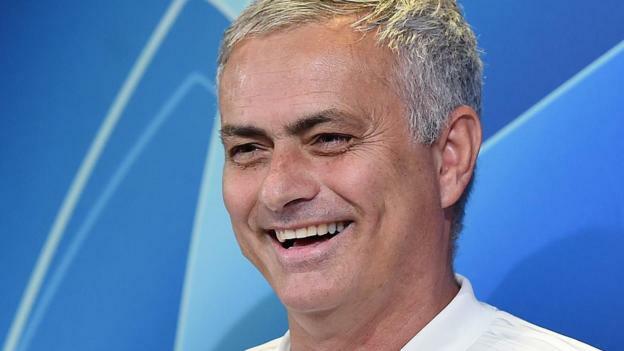 Most would keep their mouths shut but Mourinho wasn’t afraid to make a dig at the FA in a post-match interview after Wednesday’s win over Juventus. When questioned by a reporter about his celebration, he replied: ‘Do you speak Italian?’ When the interviewer answered ‘no’ he told her to ask the FA as “they would translate”. But that wasn’t all. He then burst into a laugh the kind of which you can’t help but respond to in exactly the same way. Mourinho is once again looking sharp. He’s got a smile on his face (sometimes) and things are starting to look up for United. All it needs now is for him to re-establish a bitter feud with a rival manager, like the Wenger years. Pep Guardiola and the Manchester derby anyone?